Toronto-based guitarist/composer Jamie Bonk is set to release his fourth and latest album, 5. Recorded over a three year period, this five song EP features, in addition to Jamie's own guitar playing, performances by two outstanding instrumentalists, flugelhornist Jeff Oster and pianist Loren Gold. 5 is Jamie's most diverse record to date and draws on a multitude of styles including New Wave, Classical, Rock and Ambient. Jamie's third album, My World (released August 2004), won two NAR LifeStyle Music Awards for: Album of the Year and Best Instrumental Album - Acoustic. My World blended Jamie's fluid acoustic guitar playing with performances from keyboardist Sonya Mitlewski, guitarist Peter Janson and vocalists Ron Scott and Shelley Hamilton. The album featured a cover of the Bee Gees' "Nights On Broadway" as well as the Ron Scott penned "If This Is Love" and the Janson/Bonk composition "Waiting For Winter". My World spent two months (September and October 2004) at number one on the NAR Top 100 Radio Chart. Jamie's second album, A Perfect Tomorrow, debuted at number one on the New Age Voice (NAV) Magazine's Airwaves Top 100 in 2000 and remained in the top 20 for six consecutive months. 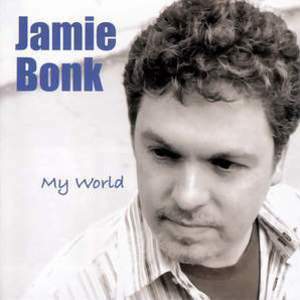 Jamie Bonk, Jamie's self-titled debut CD, which was released in 1997 in Canada and in early 1998 in the U.S., also received considerable airplay. In addition to being NAV's Radio Album of the Year for 1999, Jamie Bonk was NAV's Airwaves Top 100 longest charting CD, staying on the charts for 18 consecutive months. Jamie Bonk was also the longest charting CD in the top ten (8 months) and the longest charting CD in the top twenty (14 months). To date, Jamie's music has been played on over 600 radio stations worldwide. Both Jamie Bonk and A Perfect Tomorrow have been played on many in-flight audio programs. Airlines that have programmed Jamie's music include: Asiana, TWA, US Airways, American, America West and Canadian. Air Canada used Jamie Bonk in its entirety as boarding music during 1998. Additionally, Jamie's music has been programmed by Sirius Satellite Radio, XM Radio, AEI Music, DMX USA, DMX Canada, Music Choice, Music Choice Europe, DX Radio Network, Galaxie/ExpressVu and Echo Star. Jamie's educational background includes a B.Mus in composition from Queen's University (1987) and Classical guitar studies with Eli Kassner (teacher of Liona Boyd). At Queen's, Jamie's composition studies with renowned Canadian Contemporary Classical composer Istvan Anhalt and Professor Bruce Pennycook were instrumental in helping him win a silver medal in the electro-acoustic category of the C.A.P.A.C. competition (1986). For six and a half years (1990-97), Jamie was an Associate Guitar Instructor at the Toronto Guitar Institute, teaching hundreds of students and in every style. In 2003, Jamie became a contributing editor for NewAgeReporter.com. His artist-to-artist conversation series has featured many top name artists in the contemporary instrumental genre. A nominee for Guitarist of the Year at the 2005 Canadian Smooth Jazz Awards, Jamie is currently performing in the Toronto/Southern Ontario region, composing for his next release, and conducting an ongoing series of seminars for Apple focusing on digital recording. Jamie uses and is endorsed by Godin Guitars. 2007 the EP-album "5" was released.